All new parents experience the price panic when they purchase their first package of diapers. The minute you realize how much those diapers cost, the last thing on your mind is saving for school or the cost of daycare! Seriously, who would of thought that those little poop-catchers could be so expensive? But, don’t worry there are plenty of option to stretch your dollar and make purchasing diapers as painless as possible. 1.) Consider cloth. A lot of young mothers tend to shy away from cloth diapers because of the mess, but if you’re in a bind this is by far the cheapest option out there. You basically buy them and then wash them, but sometimes the hassle outweighs the price cut. 2.) Ask for diapers at your baby shower. Another sure-fire way to eliminate some of cost is to have a diaper shower, or tell friends and family that is what you really need when they ask. Most people will want to buy you what you truly need, instead of stuff you’ll hardly use. Plus, you can front the cost of bottles, baby monitor, and car seat when you figure that cost up next to the cost of almost two years worth of diapers! 3.) Don’t be too nit-picky. Store brands are not evil, in fact, there are a lot of store brands out there that are just as effective as name brands, and may even work better than name brands. Absorbency claim and promises of a better fit are not always true, so you’ll need to do your research before you assume that name brand is always best. The real key is to pick one brand of diapers and stick with it, because like with anything, baby’s skin is extremely sensitive and it can be hard on it to constantly expose it to different brands. 4.) Look in your local paper for coupons or sales on diapers. The best time to buy diapers is when they are on sale. You can also subscribe to different diaper brands websites and they will in turn send you coupons, which can be very helpful. 5.) Buy them in bulk. You can usually buy larger boxes of diapers online for a reasonable price. But you need to be careful that you don’t buy too many, because in the early days, your child may change diaper sizes every month! So, be careful when you buy a huge box that you are confident that your child will be in that size for a while. The trick is to commit to hunting down those coupons and deals and go with it. If you have to many of one size, be generous and pass them on to someone else who could use the help with their diaper bill. Don’t be afraid to also try and exchange a package of diapers if you child outgrows them before you get to use them. 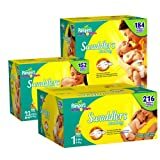 These are all fabulous tips that are guaranteed to save you some cash when it comes to buying diapers, and will make your transition into parenthood that much easier. This entry was posted in Parenting Articles and tagged cloth diapers, how to save on diapers, money saving tips on diapers on October 28, 2009 by admin.